Have Parades Gone to the Dogs? The city of Brier, Washington, recently celebrated its 12th annual SeaScare event, including such fun activities as live music, a classic truck and car display, a pie eating contest, a salmon giveaway, food drive, book sale and more. One of the highlights of the event is the “Porch Light Parade” complete with bands, cars, community groups and dogs. Yes, you heard me right, there are dogs in this parade, and plenty of them showing off their “stuff”. BowWow Fun Towne is proud to be one of the sponsors of this great community event which helps bring neighborhoods together as the residents get involved by decorating their porches and front yards along the parade route. Our BowWow Fun Towne employees and customers took advantage of the parade as an opportunity to “walk” our dogs for a little exercise and a lot of fun. 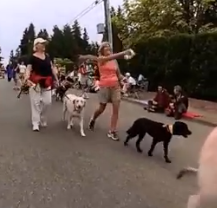 Enjoy this brief video of our dogs on parade.